We are a newly opened venue in the Amana Colonies and offer 12,000 square-feet of wedding and event space. Wedding events guests receive exclusive access to our venue on the day of the event from 8:00am-1:00am. Our facility features a ceremonial room, a main level ballroom with seating for up to 250 guests, and a full-service bar with additional seating. We are proud to offer all-inclusive amenities including a complimentary bridal suite and a groom's lounge, a private space for your closest family and friends to gather, round tables, cross-back chairs, linen tablecloths, white chinaware, stemware, all your glassware, a raised stage with a head table, a built-in dance floor, the use of our professional sound and lighting system, on-site parking, and end-of-night cleanup services. Corporate events are able to use the ceremonial and ballroom as a functioning work environment for lectors or conferences. We have tables and chairs that can me moved and arranged to accommodate your function. We have a built in sound system that is part of the rental should there be a need for a microphone or music. We also have built in smart televisions at your fingertips to display anything electronically. High speed Wi-Fi is free and you have the option for catering should your event need it. Individuals are able to use the ballroom to host friends and families for smaller gatherings. With access to our audio and built in televisions, you can make the space comfortable for your guest. Tables and chairs are included with your rental and you are allowed to arrange the ballroom to put up displays or make it easier for everyone to socialize and or play games for your birthday party, baby shower, bridal shower, graduation, family reunion, or anniversary. P.H.A.T. Daddy's is our exclusive, in-house caterer who provides servers and bartenders as needed for your event. We take great pride in having an on-site kitchen as it guarantees that we are able to serve our guests with the freshest food possible. We do not allow for outside food/caterers to be brought in with the exclusion of cakes. Prices per person vary depending on your meal preferences and event type. This average does not include alcohol, which must be purchased in-house, if desired. The Main Ballroom offers flexible seating arrangements for up to 250 guests and includes a built-in dance floor. Enjoy a cocktail or glass of wine at our full-service bar, which is located adjacent to the main ballroom. A Bridal Suite and Groom's Lounge are both available for use. Please contact us for more information. 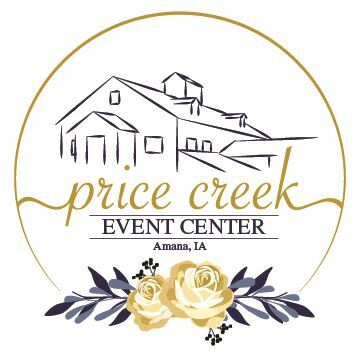 Price Creek Event Center has it all. Their staff is amazing, they know how to make your special day to be the most memorable day! Their inhouse hair salon, the guys room, girls room and the brides special getting ready room, made it so convenient for everyone to get ready and not have to worry about running here and there for appointments. The chapel and reception areas are breathtaking when you add your special touches. I have had so many of our guest compliment us on this venue. You won't be disappointed if you book your wedding here. PHAT Daddy's catering was amazing as well. We even had the Guest House Motel booked for our wedding party and guest. I highly recommend this place! My daughters wedding will be a treasured memory of mine and it is all thanks to Price Creek Event Center for making it so easy for me to enjoy the day. We are ecstatic to have exceeded your expectations! It is our goal to make everyone's day run smoothly by being there for our guests from start to finish.